Lock in a great price for Logis Hotel De La Basilique – rated 8.6 by recent guests! Our room was comfortable and the hotel was in a great location. We had dinner at the hotel, even though there were many restaurants nearby, and had a lovely meal. Breakfast the next morning was enjoyable, too. Great central location in Albert but still quiet at night. Single room was compact but clean with key facilities including kettle. Hotel seemed to be fairly recently renovated. This is a lovely and comfortable boutique-style hotel in the center of the town of Albert. Front desk staff were accommodating and helpful. There is a well-reviewed hotel restaurant. Vibe is fairly informal - but still classy. Room was large by European standards. Comfortable beds, very clean and well-equipped bathroom. Good heat and ventilation, with opening door-window in our room, overlooking the town square. All in all, a delightful place to stay. The town of Albert is well positioned for visiting WWI battle sites. A lovely family hotel and restaurant with very friendly and helpful staff. Cannot understand why it has only 2 stars. Beautiful view from Juliet balcony over the adjacent church, central location and very comfortable beds although a double would have been preferred to the 2 singles but not really an issue. Very nice shower.The staff weren't great English speakers but then again we were In France and I do not speak French !! I was worried that the mattress was perhaps too soft, but I slept like a rock and my back was perfectly fine. Central Hotel, with a very good restaurant, room was fairly quiet and comfortable with modern facilities.No parking but plenty of free parking outside in the square at this time of year. Good hotel for visiting Battlefield site and memorials. It was clean, reasonably roomy, in the centre of Albert. 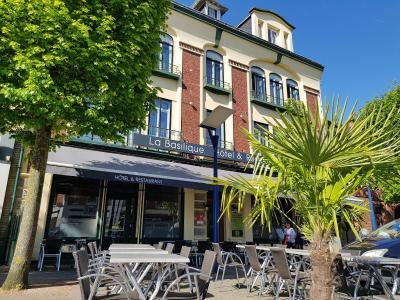 A good, clean, value for money, Logis de France, with a good restaurant, in the heart of the Somme battlefield area. Ideal for anyone visiting the museums and memorials. 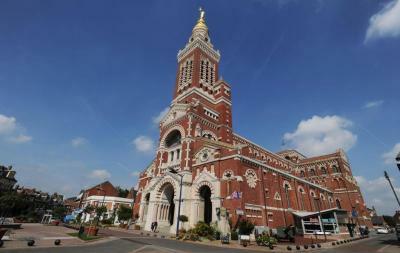 This hotel is located opposite the Basilica in Albert city center, a 25-minute drive from Amiens. It offers rooms with flat-screen TVs and free internet access. 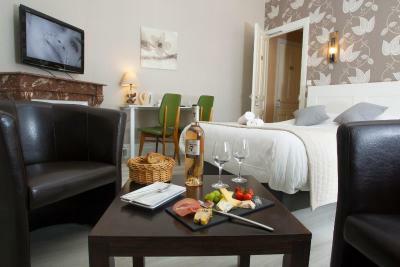 Each guest room at the Logis Hotel De La Basilique has satellite TV channels and a private bathroom. 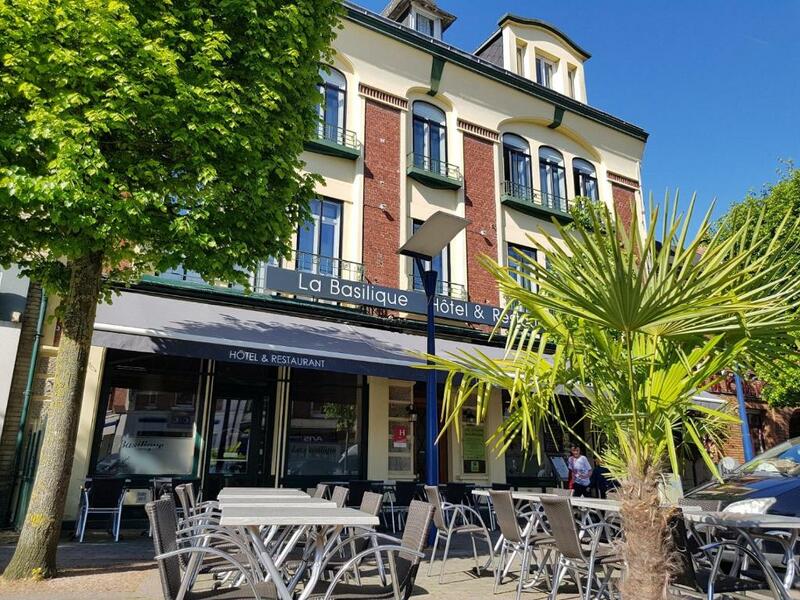 La Basilique’s restaurant serves regional cuisine and home-made specialties. The daily buffet breakfast can be enjoyed on the outdoor terrace. 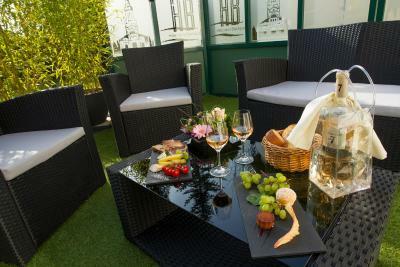 The Logis Hotel De La Basilique is a 40-minute drive from Arras and 50 mi from Lille. 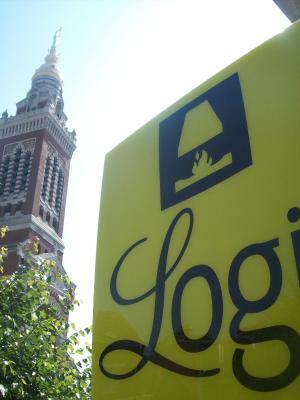 When would you like to stay at Logis Hotel De La Basilique? This room includes a flat-screen TV, free Wi-Fi and a welcome tray. The private bathroom has a hairdryer. We are happy to welcome you. The authentic 10 rooms offer comfort and relaxation. The restaurant propose a regional and traditional cooking, and the possibility to eat outside in front of basilica. House Rules Logis Hotel De La Basilique takes special requests – add in the next step! Logis Hotel De La Basilique accepts these cards and reserves the right to temporarily hold an amount prior to arrival. Bit of a hunt for a parking space. Breakfast OK but machine coffee not very good. Location, staff, food .. all perfect! 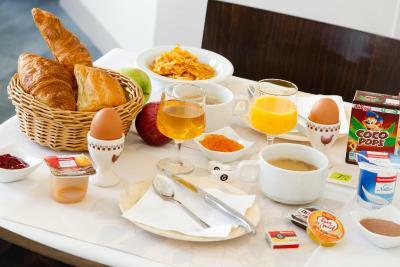 Continental breakfasts aren't really for me - but when you're on the continent what are you to do? I didn't ask for an alternative though, just popped to the bakery down the street. Although outside parking is available at this time of year, it is not as secure as we would like.Also room was approached by a very noisy staircase, which could be a problem in busier times. it could really do with some soundproof floor covering. Hotel is 'tired' and would benefit from complete re-decoration. Rooms were small. There was no lift so we had to negotiate at least 40 stairs as we were on the 2nd level. An old building & they were very narrow. There was no air conditioning. The reception didn't have ideas re touring around. To get to other parts of the surrounding areas we were reliant on the train. so spent many hours waiting at various stations for connecting trains to the towns we were interested in. Think unless you have your own transport or have an organised tour don't stay here. We should have gone to Amiens. It was a bit of a struggle hauling our luggage up the steps.